Singapore may not have the history or tradition of that other street venue in Monaco, but Formula 1's only true night race has made itself one of the most popular events on the calendar in its five-year tenure. The demands of a paddock sticking to European time – which means bed at 5am and breakfast at 2pm – is now second nature to the regulars, but every year Singapore organisers throw up some great surprises and entertainment. This time around it was the turn of Noel Gallagher and Katy Perry to get everyone in the party mood as they headlined the music acts that are now a mainstay of the Singapore Grand Prix weekend. Formula 1's drivers were also back on the catwalk in Singapore as the weekend proved the perfect place for the latest Amber Lounge Fashion Show. After the success of the event in Monaco, it was the turn of F1's current reserves and future stars to strut their stuff in a fashion show bringing to life the latest designs from La Perla, Briono and Stefano Ricci. With Sam Bird, Jules Bianchi, Esteban Gutierrez, Sebastien Buemi and Dani Clos all becoming the centre of attraction on stage, R&B sensation Lemar also excited the crowds as he pumped out some of his most famous tunes. With the Amber Lounge post-race party on Sunday once again proving to be the place to celebrate another fantastic week of racing, with guests Fernando Alonso, Mark Webber, Felipe Massa, Nico Rosberg and rock band Maroon 5, F1 showed that it knows how to work hard and play hard in Singapore. 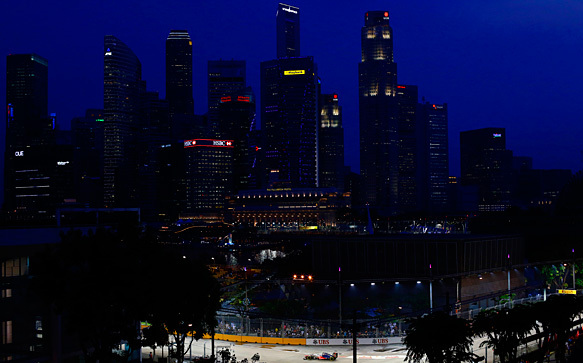 As the music continued until sunrise on Monday morning, the sport could reflect on the positives that the Singapore GP has brought to F1 – on a weekend when a new five-year race deal was announced. It's not very often that the high-octane, eardrum-shattering world of Formula 1 falls completely silent, but there was good reason for it to do so before the race in Singapore – as everyone remembered a figure who had done so much for the sport. Professor Sid Watkins passed away in the weeks between the Italian and Singapore Grands Prix, and there had been an outpouring of sadness for a man who, in more than 25 years service to F1, had helped improve safety and medical facilities more than anyone else. The FIA Institute, of which Watkins had been an Honorary President, as well as the FIA and Formula One Management all agreed to hold a minute's silence for him on the grid before the race – which was attended by drivers, team principals and other leading figures from the sport. There was a less public showing of affection too, with a Book of Remembrance being available for F1 figures to leave their reflections on the man. It will be passed on to his family. It also said as much about race winner Sebastian Vettel as it did about the impact of 'the Prof' that the young German dedicated his win in Singapore to Watkins – even though their paths could not have crossed that often. "I would like to dedicate it to one very, very special man, Professor Sid Watkins who passed away and we remember him for sure," said Vettel on the podium. "I think he is one of the biggest reasons we can go out on a circuit like this and enjoy ourselves and be reasonably safe. He pushed the boundaries in terms of safety for all of us, so a big thank you to him." 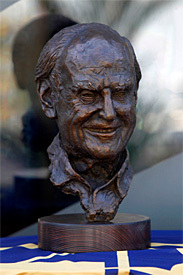 F1 will never forget Professor Sid Watkins. Sebastian Vettel changes his helmet design so often that it sometimes becomes bigger news when he doesn't have a different lid on at a grand prix. 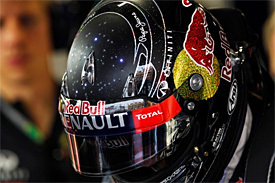 However, in Singapore, he surpassed the best of his previous designs with a helmet that paid homage to Formula 1's only night race. Vettel had wanted something that made the most of racing in the dark, and together with his helmet supplier Arai he came up with a unique flashing stars feature. Using a battery tucked away inside the neck area of the helmet, it featured 24 LEDs that flashed the different zodiac signs of the double world champion and his family members. And, rather than needing a switch to be activated, a special motion sensor was used to ensure the lights only came on when the helmet was in action. After 15 seconds of inactivity, the lights would go out. Arai put in a pretty big effort to get the helmet ready. It had to ensure that the lights did not interfere with Red Bull's radio system – and then of course it needed confirmation from FIA race director Charlie Whiting that he was not worried about the helmet on safety grounds. Vettel was not the only driver featuring a new helmet. Lewis Hamilton paid tribute to Singapore with some different colours, while Mark Webber used a one-off design that had been chosen after a competition to paint a lid for him. Fernando Alonso has sat in some pretty special Ferrari racing cars during his time at Maranello – but he got himself inside something unique over the Singapore weekend. As part of the celebrations to mark the 500th race partnership of Shell and Ferrari, which is the longest tie-up in the sport's history, the oil company had commissioned a special life-size Ferrari F1 car to be brought to Singapore. 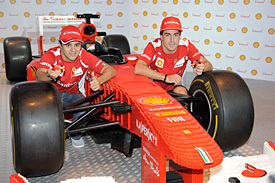 The 2011-spec 150 was made of LEGO – or more specifically 200,000 LEGO bricks. It had taken a team of 16 people at a special LEGO factory in the Czech Republic more than six months to design and plan the car – and then a further 10 days to assemble it. As finishing touches, the car featured real Pirelli race tyres, a proper seat belt and a steering wheel. The car, which measured 5.4 metres in length, the car was big enough for Alonso to climb in and try for size. And, knowing how exceptional Alonso has been on track this year, he could probably have hauled it to a podium finish in the real race as well if he had wanted!